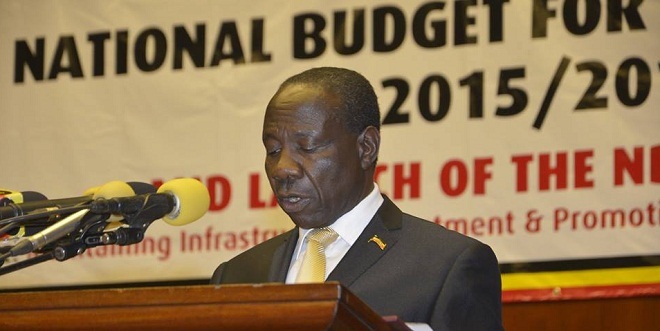 FILE PHOTO: Minister Matia Kasaija reads out the Uganda 2015/16 budget. He reads this year’s budget June 8. Planned government borrowing and increased taxes to fund the Shs29 trillion budget for financial year 2017/2018 have left investors and business leaders worried about the coming year, ahead of the budget announcement next week, an informal survey by The Independent has shown. While expectations are mixed, any optimism in the private sector is cautious, tempered by low expectations of government’s ability to execute projects efficiently to create an enabling environment for private sector growth. “The government is borrowing locally and competing for the same funds with us in the private sector to fund this infrastructure budget,” Elly Karuhanga, chairman for Uganda Chamber of Mines and Petroleum, also founder of Kampala Associated Advocates (KAA), told The Independent in an interview. Karuhanga said that while businesses welcomes government’s focus on infrastructure development, as this will facilitate economic activity in the long run, it was being done at too high a price for the private sector. He added that government was also taking long to pay domestic debts which were not only critical in expanding businesses but also in meeting their debt obligations. Karuhanga said prompt payment of suppliers by government would have enabled the private sector service their bank loans and therefore provide more services. Domestic arrears are estimated at Shs 2.7 trillion. Government plans to raise Shs14 trillion, about 48% of its Shs 29 trillion budget, through local revenue collections, and the rest through budget support and borrowing, according to the Budget Framework Paper 2017/18. To boost revenue, government also plans to increase taxes on sectors like beverages, tobacco, spirits and others. Under the theme “Enhanced Productivity for Inclusive Growth and Job Creation”, government will spend more than 30% of the budget on infrastructure investments, with approximately Shs4.8 trillion on works and transport, up from Shs3.8 trillion in the current year, while energy and mineral development will see its expenditure increase from Shs2.3trillion to approximately Shs2.9 trillion during the same period under review. A cross section of chief executive officers and captains of industry interviewed by The Independent ahead of the budget reading ceremony scheduled on June 8, showed concern that he budget to be announced by Minister of Finance, Planning and Economic Development, Matia Kasaija, did not adequately respond to the economic slowdown that had seen companies close, reduce production or suffer crippling losses over the past year. Instead of boosting economic activity, business leaders worried that the measures pursued by government would further damage private business. James Bowmaker, the country director of Nile Breweries Limited, a subsidiary of Belgium- based AB InBev, said while they were pleased with the allocation of more resources towards development and repair of infrastructure like roads and electricity supply, targeting the same existing tax payers to foot the bill was an unfair burden and would discourage the flow of investments into the country. “We all need the economy to grow faster than our neighbors and other countries in Africa. Investment in the country should be one of the top priorities so as to stimulate this growth and over-taxing the top industries in Uganda is not a good advertisement for investors,” Bowmaker said. He said government needed to target more companies and individuals avoiding or evading tax, instead of increasing taxes on those who were already paying significant amounts. Currently, Nile Breweries Limited with market share of 59% pays an estimate of Sh230billion a year in taxes, making it one of the leading tax payers in the country. Growth estimates are also a cause for concern. “I am worried that the estimate of the country’s growth rate, for the current year, has been revised downwards,” Bowman told The Independent. He was referring to a recent report by the International Monetary Fund (IMF) that revised Uganda’s GDP (gross domestic product) growth rate downwards, from an earlier projected 5% to between 3.5% and 4% as at the end of this financial year. Similar sentiments were shared by Uganda Breweries Limited’s Marketing Manager, Edgar Birungi. “Infrastructure development – roads, power – are important ingredients for private sector growth, but we have also observed that the beverage or beer industry is highly taxed,” he said. Birungi said government’s opportunistic target of selected industries such as his was counterproductive, as it was responsible for the surge in prices of final products and ultimately led to low demand, undermining their tax contributions. Mubaraka Nkuutu Kirunda, the acting managing director at the Uganda Manufacturers Association said over-taxation had hobbled the manufacturing sector. “Yes, generally industries in Uganda are over taxed,” he said, citing the proposed increase in excise duty on non-alcoholic beverages (not including fruit or vegetable juice) from the current 10% to 13% starting July. Other tax increases government has proposed include: Tobacco, from Shs50,000 to Shs55,000 per 1,000 sticks; Spirits made from locally produced raw materials, 60% or Shs5,000 per litre, whichever is higher; undernatured spirits, 100% or Shs5,000 per litre, whichever is higher per litre. Kirunda said the disproportionate tax regime also undermined job creation in the private sector. “The private sector employs millions of people, many more than the 400,000 employees of government,” he said. Another major gap seen in the budget was lack of government solutions to the high costs of financing business. Kirunda said while government had allocated Shs180billion to recapitalise Uganda Development Bank, the amount was a drop in the bucket compared to the need of businesses yarning for capital to expand and innovate.